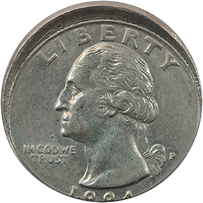 Off-Center - An off-center error strike is a coin struck with the planchet off center leaving part of the planchet blank, and part of the details missing. Broad Strike - A broad strike is a coin struck without a collar, thus when the coin is struck the metal is allowed to expand and increase in diameter. Cud - A cud error occurs when a significant part of the edge of the die deteriorates and falls off. This leaves blank areas around the edge that are raised and devoid of detail. Rotated Reverse - A rotated reverse usually occurs when one of the following happens: A loose set screw that allows the die to turn in the holder; a broken die shank that allows the die face to turn; and a misalignment due to the die being installed improperly. The loose screw is blamed for most of the early rotations, with the other two causes dividing up a minority of the rotations. Planchet - A planchet is the round metal disc used for creating a coin and varies in size and composition based on the coin to be created. Blank Planchet - A blank planchet is a planchet that was either very weakly struck or never struck with the design it was intended to carry. Double Die - Doubled dies are a result of the way in which in the United States Mint's dies are created. 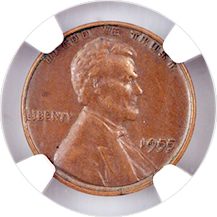 Before 1997, a die was made by hubs that contained the raised design elements that were intended to appear on the coin. The blank dies were heated (to soften them) and then were pressed against the hubs to transfer the design from the hub to the striking die. In every case, one impression was not enough to transfer the design elements from the hub to the die, so multiple impressions were required to transfer enough of the design. For this reason, after the first impression was made, the die was reheated and prepared for a second impression. The mint workers would use guides to align the hub and worked to align dies perfectly to prevent overlapping, or a doubled die. Failure of mint workers to align dies properly during this process resulted in doubled dies. In many instances, three to four impressions were required which could but rarely led to tripled and quadrupled dies. Double dies appear as repeating, overlapping patterns in the coin design and/or date. 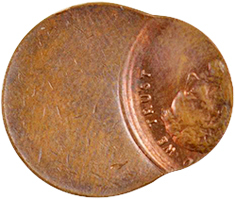 Clipped Planchet - A clipped planchet error occurs when a coin is struck on a planchet that is not entirely intact. Clipped planchets come in a variety of defects, including straight, curved and ragged versions. Die Defect - An imperfection on a coin, caused by a damaged die. Wrong Planchet - A coin design struck on the wrong planchet for its respective denomination. 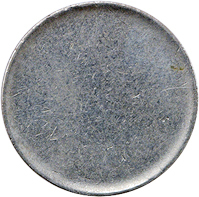 Mint Canceled Coin - In 2003, the U.S. Mint acquired machines to cancel and effectively destroy sub-standard struck coins, planchets, and blanks. Using high pressure rollers and blades the machines deform the coins in an appearance similar to a waffle pattern.